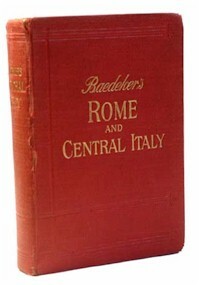 These are all the Baedeker editions on Italy in the English language. See also editions in German and in French. As in the other languages, there was, apart from the trio of Northern, Central and Southern Italy, also a single-volume series covering "Italy from the Alps to Naples" - Naples being as far south as most tourists normally made it. There are some nice special features in these books, notably the coats of arms of the popes in Central Italy - helpful if you are trying to identify the age of some artifact with a coat of arms. Note also that Italy had only just become a single state when these books started appearing, with the dust settling on the final battles with Austria over Venice in 1866.